The Westview Wind Ensemble is the highest-level ensemble open to 10-12th grade students. Students are accepted by audition only; students not accepted shall participate in Symphonic Band. This ensemble performs the most challenging repertoire and demands the most skill and energy from its members. Students are expected to take private lessons and participate in the OMEA District XV Solo & Ensemble festival. Wind Ensemble members may concurrently enroll in Symphonic Band on a secondary instrument with the director's approval. 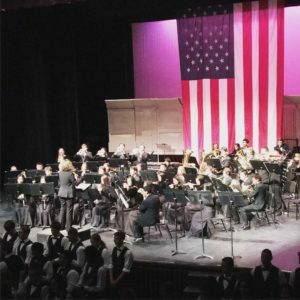 The Wind Ensemble performs at 4-5 evening concerts throughout the year, and travels to 2-4 adjudicated festivals each spring. Non-senior members will perform at Westview's graduation ceremony in June. Additionally, the Wind Ensemble members combine with the other two bands to make the marching band that performs for the Rose Festival events in the spring. Assessment 2: 2 Octave Gb and A Major Scale. Percussion, all of Cirone #1 @ 120bpm.